Touted as one of the first all-suite hotels in Pune, Cocoon at Magarpatta City is all about luxury and comfort. If you’re looking to get some quiet time but can’t head out of the city, this property is perfect for you. What makes Cocoon unique is that it is perhaps one of the only all-suite hotels in Pune. The spacious two-bedroom suite has everything one needs for luxurious, comfortable stay; from a well-stocked mini refrigerator to 24×7 room service and more. Complimentary buffet breakfast is served at their in-house restaurant @M The World Cuisine, which is done up beautifully in earthen tones, sophisticated wooden furniture and artsy wall decor. Apart from this, Cocoon also houses an open-air restaurant with a bar; a banquet hall; a squash and a tennis court and swimming pool. So if you’re getting bored in your room, so for a quick swim or even a game of tennis. Despite being a three-star hotel, Cocoon’s pricing is surprisingly quite affordable. 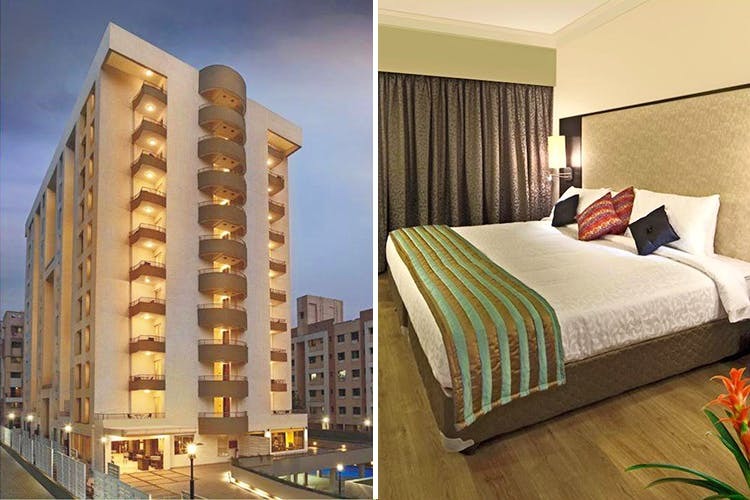 A night at their one-bedroom will cost about INR 5,000 while the two-bedroom suite can go up to INR 7,000 per night. Stay at the Cocoon Hotel for a luxurious experience that won’t leave you broke.